No matter how you slice it, organic feed can cost a small fortune. Hopefully I can save you from spending $80 per 50lbs like I did my first time around. I now pay less than half that. Thank you Lord. It still hurts my heart when I think of how much I could have saved. Nevertheless, I am glad to share our story so others can make wise decisions. 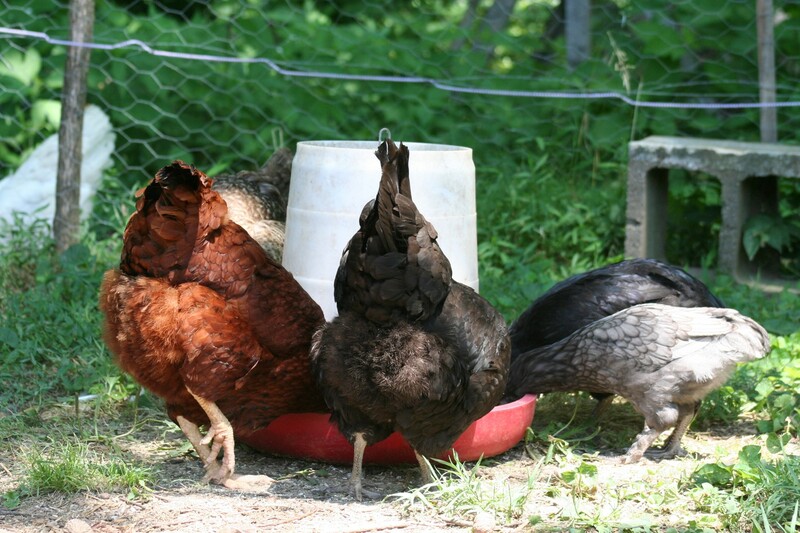 Just to give you an idea…the cheapest chicken feed, non-organic, I have seen is around $10-12. 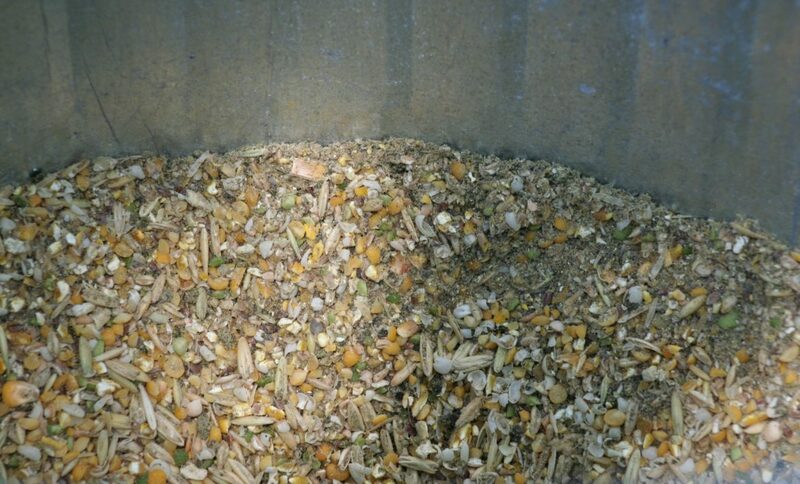 That is a BIG difference, but there is also a big difference between gross looking pellets and a feed where you can see the corn, peas, wheat berries and so on. When I ordered my first set of chicks, I had no clue what I was doing. All I knew was that I wanted organic eggs. I had looked at my local feed store and there were not any organic options. So I went to My Pet Chicken for my first organic feed purchase. I will say that it was much cheaper to purchase organic feed from MPC if you lived in the western half of the United States. But of course I live in the Eastern Untied States, go me. I knew I was going to have to find a cheaper way to feed our chickens or I was soon going to have to put an end to my hobby. While searching online I had read where you could make your own feed, and found a company called Azure Standard that had all kinds of bulk organics. They’re amazing. After doing all the math and I believe it averaged out to about $55 per 50lbs with the recipe that I had found. Score! It was going to be a lot more work and thought process on my part, but that is worth $25 every 3 weeks to me (at the time 50lbs got us about 3 weeks). While I sat in front of my computer, I decided to give my brain a break before I finalized my order. I picked up a magazine my mother-in-law had given me several months before, A Guide to Chicken Breeds from Hobby Farms Magazine, and began combing through it. About halfway through I noticed an advertisement for an organic feed company. I thought there was no way that it would be near me or be cheaper than making it myself, but I decided to look it up anyways. Low and behold they were based out of Virginia. Better yet, after shipping it averaged out to about $45 per 50lbs and I didn’t have to make it myself. And still even better than that, they were soy free! Not that organic soy is terrible for you, but I believe we could all use a little less soy in our lives. I was dancing a jig. I ordered directly from New Country Organics for around six months I believe when I noticed that they were adding new “re-sellers” every week. Again I thought there was no way there would be one near me, but decided to look it up anyway. I can’t tell you how shocked I was to find a co-op I didn’t even know existed only 10 miles from my house that now sold New Country Organics feed. The kids and I hopped into the car and took a little field trip to check out the co-op and see how much they charged. When I got there I couldn’t find any organic feed on the shelves, so I went to the front desk. Apparently not all the feed they carry can be shelved inside the store, so it is kept at the loading docks. I told the cashier that I had seen where they were a re-seller for New Country Organics and wanted to see how much they charged. Surprisingly enough after tax it was $36 for 50lbs. Now that is something to get excited about. From $80 down to $36…..ch-ching! For over 3 years I have purchased New Country Organics feed and I love it, and so do the chickens for that matter. And why not, it looks like something they would naturally find scratching around a field anyways. I would assume that most anywhere in the Eastern United States you would find New Country Organics prices to be similar in feed stores or when purchasing directly from them. As far as the Western United States goes, it may be a different story though. Good luck in your feed hunting adventures! I would love to hear about it.